“Here’s what you’ll find and how you can use the outfit ideas library. It’s broken up into two sections: Spring & Summer and Fall & Winter. Both sections have a dressy and casual section, as well as being broken up by jean color, slacks, dresses etc. Some of you have told me to please not get rid of the printable PDFs because you love hanging them in your closet for outfit inspiration. No worries! They’re not going anywhere. In fact, I’ve made new ones which you’ll see when you scroll down to the very bottom of this page. As of now, there are over 50 Fall and Winter Outfit Ideas and over 30 Spring and Summer Outfit Ideas waiting for you in the Outfit Ideas Library. Plus access to two printable PDFs for you to hang in your closet. How can you access this you ask? And how much does it cost? That’s right. It cost zero dollars. Affordable right? Now, in the future I may have some eBooks for sale, but for now everything you see is free. How can you access it? Since it’s free, I decided to make it available only for Mom Fabulous newsletter subscribers. If you’re already on my list, you should have received an email by now sharing the link and password to access it. If you’re not on the list, just know that I don’t spam you with a crazy amount of emails and I’m not salesy (that’s not a word). I’m just me, sharing with you new blog posts, a little about my life of full-time travel (yep, I’m on the road 100% right now) and if there’s a sale I think you might want to know about. If you would like instant access to the Mom Fabulous Outfit Ideas Library, just type in your information in the form below. Easy peasy. I truly hope you find the library useful. I sure had fun putting it together and I can’t wait to update it every month with new outfits and shopping links. We’re working on them as we speak! 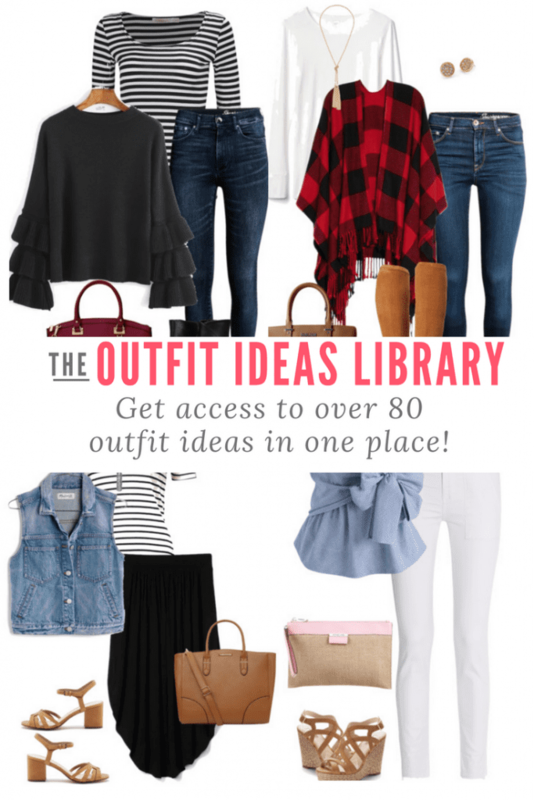 Outfit Ideas Library sounds perfect!